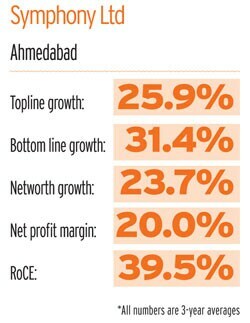 The 27-year-long business life of Achal Bakeri, the Chairman and Managing Director of Ahmedabad-based Symphony Ltd, is a fascinating tale of ups and downs. The company, in its first phase, tasted phenomenal success in a short period, followed by near bankruptcy. In the second phase, it learnt from its mistakes, won back customer and investor confidence, and emerged as India's largest air-cooler manufacturer with a market capitalisation of over Rs 6,300 crore. No wonder, it has won two awards - "Best SME-Overall" and "Best SME-Manufacturing" - in the Rs 250 crore and above turnover category in the 2015 edition of Business Today's Best SME Awards. The first part of Bakeri's entrepreneurial journey started in 1988, when he decided to launch air coolers instead of joining the family's real estate business. Back then, the industry was totally unorganised. The products, too, looked odd and clumsy. So, Bakeri launched an air cooler that resembled an air-conditioner, for Rs 4,300. In just two to three years, Symphony was able to match competitors such as Crompton Greaves, Usha and Polar, which were large multi-product companies, in the air-cooler category. Then, it decided to diversify. In 1994, it got listed on exchanges, built a large factory, and launched new models. It tried to replicate its success with air-coolers in other categories by launching new models of water heaters, room heaters, water purifiers, air-conditioners, washing machines and exhaust fans. But the products failed to attract consumers. Worse, this made Symphony lose focus on air coolers. By 2001, investors lost faith in the company, its net worth eroded, and the stock became a penny stock. The company was referred to the Board for Industrial and Financial Reconstruction or BIFR. It had a debt of over Rs 50 crore. "There was no cash on the books, our products were considered me-too, our dealers had virtually given up on the brand and amusingly (now that I can afford to use the word) the only constant was revenue invisibility," Bakeri recalls in the annual report for 2013/14. The second part of Bakeri's business life begins here. Instead of closing down the business, as advised by many, he decided to give it a try again, and this time concentrated only on his core competency, air-coolers. "We continued to believe that one of the first things people aspired to own was a residential cooling product," says Bakeri. So, the company abandoned other products. Instead, it launched new air-cooler models in various formats. In the next six years, the focus was on bringing down costs to increase margins. It also decided to outsource manufacturing to become asset light. Its next move was to tap overseas markets. A breakthrough came when it acquired a bankrupt Mexican company, International Metal Products Co (IMPCO), in 2009, which gave it access to the US market and newer models. There has been no looking back since then. From Rs 238 crore in 2010/11, the turnover grew to Rs 466.39 crore in 2013/14. Net profits in these three years have been Rs 50.3 crore, Rs 62.6 crore and Rs 98.9 crore, respectively. "The size of the air-cooler market is estimated to be seven million units worth Rs 3,000 crore. It is expected to grow to 10 million units by 2020. The global market (except China) is estimated to be another Rs 4,000 crore. However, only 20 per cent volumes come from the organised sector," says Nrupesh Shah, Executive Director, Symphony. The company's products command a 10-12 per cent premium over products offered by competition. About 15 per cent revenues come from exports to 60 countries. "Over the years, we have introduced a wider range, created large AC-like air coolers, launched premium air coolers, put air coolers on castors and moved to central air-cooling through the acquisition in Mexico. We have implemented just about everything the purists had warned us against - and succeeded," says Bakeri. Last month, Symphony bought Munters Keruilai Air Treatment Equipment (Guangdong) or MKE, China, which had a turnover of Rs 93 crore last year. It has one of the best manufacturing and research facilities in Asia, which will help Symphony in the coming years, says Shah. "Symphony de-risked the seasonal nature of the business by offering good discounts during off-season and penetrating countries like Sri Lanka," says Himanshu Shah, an independent director on the board of Symphony. The best part is that Symphony still has a huge market to tap, say Motilal Oswal analysts Niket Shah and Atul Mehra. "While 54 per cent out of 143 million households live in hot and dry climatic conditions and 4 per cent live in moderate climatic conditions, only about 8 per cent own air-coolers, providing a huge opportunity for growth," they say. Nrupesh says the company is poised to grow at a compounded annual growth rate of 20-25 per cent in the medium term. For the time being, everybody is buying Symphony's growth story, and it seems that Bakeri can afford to forget his past mistakes.